. :: The Perils Of Show Jumping Sport - 28 ::. So, I know it has been a while! But as much as I would love to say that the WKD team have been quietly ensconced at home with our feet up, the reality is that these past couple of months have been crazy. But again, what is new when it comes to our life! Last blog has seen us recovering after the excitement of Dublin horse show, and the weeks after were spent in preparation for the feature event of Sam’s year - the Furusiyya Nations Cup™ final in Barcelona! As a team this year, the Egyptians had held their own admirably at their one appearance in the premier nations cup league in Abu Dhabi at the beginning of the season. Their third place against more experienced and seasoned campaigners in the nation’s cup league gave the guys a good boost and a belief that they were ready for the challenge of appearing at the finals of the nations cup league in Barcelona. So we arrived in a cloudy Barcelona late September - it was a bit of an organisational nightmare for us as we were leaving directly from there to Morocco for the royal tour - and so I had one lorry load of horses waiting in England and then Sam had two horses for the nations cup show with the other lorry in Barcelona ! The plan was then for the two lorries to ‘rendez vous’ after the show in Barcelona, and then head directly to the port to cross over from Spain to tangiers. However, this is not as simple as you might think as there is a lot of paperwork involved and like all best plans most of ours decided to promptly come apart - with everyday seeming to herald some new disaster - and to be honest it was just a relief to arrive in Barcelona with the two horses - sumas zorro and limelight de breve in one piece! The first thing that awaited me on entry to the show was the news that the guys had decided, in my absence and in the absence of everyone else daft enough to take it on, to nominate me chef d'equipe. Nothing like being thrown in at the deep end - with my first foray into top end team management being at none other than the most prestigious event in the equestrian calendar - with loads of money at stake - and oh the small matter of it being an Egyptian team’s first time at such a thing so the whole of the Egyptian equestrian community was eagerly watching and praying for a good outcome.... No pressure at all then...! My first "duty" as chef was to gather up the lads for their team photo shoot - not easy when you have four independent Egyptians who are permanently either attached to their phones or simply nowhere to be found. It was like trying to herd cats into a box - I would capture one or two only for them to promptly disappear again. It was going to be a long week!! My team consisted of Sam, Abdel Said, Karim El Zoghby and Mohamed Talaat - the same team which had previously competed in Abu Dhabi this year and it was obvious that this outing was a great help as everyone more or less knew how the other went and what the best format would be for the team line up. With them all eventually present and correct it was off to the photo shoot we headed - were the guys were promptly attacked with makeup artists and professional photographers choreographing them into various positions using gym implements - it was very amusing to watch their reactions to it all - with some of them definitely enjoying it more than others !! I was then informed that I had to attend the draw for the start order. I kept hearing "Don’t worry; it is just a formality, you just have to sit there and find out when we are to go. Nothing complicated we will wait for you outside." These words followed me as the lads steered me the right direction promptly abandoning me in a large hall containing various seats facing a large platform, which in turn contained rows of seats. Seeing my obvious look of bewilderment, I was quickly taken under the wing of the other seasoned chefs, several of whom I already knew thank goodness and polite conversation ensued as I tried to find out what exactly was going to happen and where exactly I was meant to be! Next thing I knew I had an Egyptian flag stuck onto my arm and was being herded onto the platform to sit amongst the powerhouse of the nations cup chef d'equipes. Feeling slightly out of place and way out of my depth, I kept my head down trying not to look at the banks of journalists in the seats in front and just concentrated on writing down the order to go, determined not to mess up at the first hurdle. We were drawn a respectable eighth to go which out of nineteen was not the worst draw and I sat back and relaxed as the rest of the draw took place, only to promptly tense back up again when I heard the next announcement from the floor - "we will now have a short interview with each country’s chef to find out their views on the draw and on their nations chances." I thought you must be having a laugh; surely this must be a joke. I felt the guy beside me who had also been thrown in as temporary chef, the Belgium chef had apparently missed his plane so they sent their team vet! Tense and the two of us glanced at each other with a shared expression of panic. I was really going to kill the guys later! I somehow managed to stagger through my -interview- and through the next meeting of chefs, my head spinning with lists of do’s and don’ts I eventually headed back to the stables to meet the guys - and check everything out for the warm up class later that day. It soon became obvious to Sam and I that Zorro was not looking very happy and that the trip down had drained her more than we would have wished - she was still recovering from the bad virus she had had before Dublin and to be honest we were very concerned that she would even be able to make an appearance - but with only four in the team and no reserve we tried our best to help her feel better - the vets gave her drips and we took her out for as many walks as possible and bites of grass. 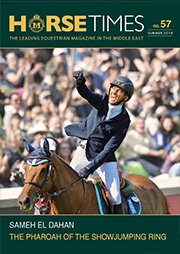 It was decided that Abdel would go first with his grey stallion Vingino, then Mohammad Talaat with Connaught, followed by Sam and Zorro and finally Karim with Amelia. The day of the class came quickly and the course walk proved that this was to be no pushover - it was going to be a tough trial of horse and rider - not the best to face when we had our worries that Zorro was not on her top form. Abdel was pathfinder for the Egyptian team and unfortunately Vingino was also having a bit of an off day, and with four poles on the ground the mood in camp was subdued. However, it became clear that Abdel’s horse was not the only one finding problems as well known combinations from stronger nations also had uncustomary rails down and it was hard to see who was going to be victorious at this stage. Next up for Egypt was Mohammad and Connaught - this fantastic stallion popped effortlessly around the course although it soon became clear that the time was to be against him - however at this stage the clear jumping even with the time penalties was a welcome break and the team started to breathe a bit easier and with the other teams having very mixed results it was still not a lost cause and Egypt was very much still in the running. However it became clear to Sam and I in the warm up that Zorro was not her usual exuberant self and was definitely feeling down. Although we hoped that she might perk up in the ring, it was not to be as she landed on several back rails and had a foot in the water. Even though we had known that she might be the discard for the team it was still hard for everyone and it was with big expectations on his shoulders that Karim entered the arena as our last rider to go. He answered every question and as Amelia soared over the last clear to cheers from us all, Karim ensured himself a chance of the lucrative fifty thousand euro bonus which was being offered for any combinations who could jump two clear rounds. With the help of the clear round and the time faults Egypt ended up just out of the top eight qualifiers at eleventh, but from nineteen nations and with some very strong countries finishing behind them it was a very good result for the team. The way the final works is that those nations not in the top eight automatically qualify through to the consolation final - itself a very high value class - which was to be a tight competition in itself with Brazil, Australia, Qatar and Italy some of the other tough countries in the group and it was going to be another long day ahead for the team. The finals were all jumped at night and the floodlit arena looked truly amazing as we walked the course ready for the start. Sam and I had decided that the best plan for the team, and most importantly for Zorro, was that she would go last so that if she did not need to jump we would not start her- the team readily agreed that this was the best scenario and so once again we settled in for the long wait to see how the class would pan out. Once again Abdel lined up first and managed to steer Vingino around this time for only a couple of rails on the ground, then again Mohamed jumped second and again jumped a super round, just unfortunately falling victim once more to the clock and gathering up some time penalties. For Karim this was a doubly pressurised round as there was only him and one other rider in contention for the fifty thousand euro bonus for jumping a second clear. Everyone was silent as he jumped round and there was a huge groan which resonated around the arena as he tipped a rail - what an expensive fence! As it was still very open with all the teams last member to jump Sam had to go again as at this stage they were still lying in second behind Brazil - but as each last member went in the results kept changing and it was obvious that a good result would mean a strong finish for the team. However although she jumped better Zorro’s toe in the water meant that the teams score could not be improved and it was just now a question of waiting and watching as the other teams played their hands. Qatar was to be the eventual victor and we were to end up fifth place - but a super result that everyone was very proud of - in the end it was only one pole which stood between fifth and first it was that tight between the scores. For the WKD team our show was now over - Zorro would not jump again as there was no way we would put her in the Grand Prix - it was a lift home with the Irish team for her and a nice few months well deserved break in the field. And for me, it was the end of an interesting few days as chef d’equipe - I must say I was lucky to have such an amazing bunch of guys to work with and I know that if luck had of been on our side the result could have been completely different - exciting times are ahead for the Egyptian equestrian scene as they have showed they are not the poor relations anymore and that they can more than hold their own against the established nations, I for one am excited as to what the future holds for the team! As for Sam and I, our next stop was Morocco where we spent three weeks jumping in the royal tour - and I am sure knowing us - it wasn't a dull trip! so wait for my next blog to hear all about it.